Most companies invest lots of time and money into Facebook, and everyone’s got the same idea: “Every company has a Facebook Page, so we need one too!”. But that kind of thinking can lead to some problems. What if you don’t have any set goals or strategy? What if you’re unsure of what to communicate and what you want to achieve? Whether it be increasing sales, enhancing the company’s image, or improving recruitment processes, you need to know in advance. Another problem is that people use Facebook as a method of implementing and executing strategies. The thing is, they rarely focus on the step before – actually creating that strategy. Few marketers are aware that Facebook can be used successfully prior to promoting content. And it’s a great tool for preparing your entire communication and marketing strategy. Let’s dig into it and find out how you can use Facebook in the content creation process. Continuously gathering knowledge about your target audience is crucial for creating your strategy and content. You have to know who you’re speaking to – who your audience is, what they’re interested in, how they communicate, what problems they encounter, etc. But where can you find this knowledge? Buyer personas, which your Sales and Customer Service departments have likely already created. Facebook Insights and the ‘People’ tab – information about location, age, and gender can all be found here. That’s enough for a basic knowledge base. A ‘best posts’ analysis on your Facebook Page – A simple yet informative analysis of what your audience likes the most (including details like format and topic). You can check your best posts with Sotrender. 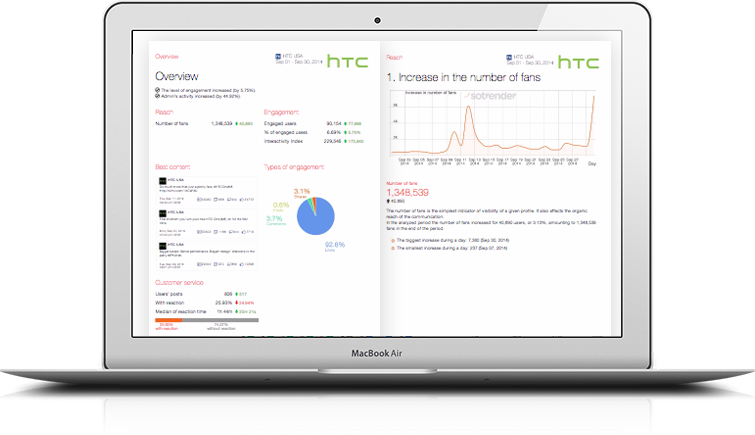 Monitoring what your competitors do – Benchmark your business and track what other companies are posting on Facebook. Don’t blindly copy them, but rather use them as inspiration. Pay attention to the type of content that works for them and how they engage their audience. Learn from their successes and failures (keeping you a step ahead). With Sotrender you can create various groups to stay up-to-date with what your competitors are doing on various social media channels. Custom reports, e.g. Audience Scan or further research, which are carried out by Sotrender, offer you more detailed information about your target audience, e.g. specific interests (whether they prefer football rather than basketball, fast food rather than fancy restaurants, the kinds of books they read, etc.). If your audience enjoys music festivals, for example, you can create a case study connected to that or target new users based on this criteria. This one’s obvious. After you’ve produced your content, it’s time to share and promote it! But think outside the box and go beyond the standard Facebook post. Share your content on relevant Facebook groups. Try to be neutral and don’t overlap. Engage in relevant discussions and make your content a valuable piece of advice for anyone who’s looking for it. Don’t publish your content everywhere like crazy, because you’ll only annoy people or even get banned. Redistribute and refresh your content. Many pieces of content you’ve produced can be reused after some time with only minor adjustments or updates. Creating so called ‘evergreens’ will also help you get the most out of your content. Play with various types of formats – an article can be easily transformed into a video, presentation, graphic, or infographic and used again! As we know, the constant and decreasing rate of organic reach isn’t satisfying anyone. When you can, take advantage of Facebook Ads. Just keep in mind that it can be costly. Always think twice about what you want to promote, how often you want to promote it, and your available budget. When it comes to targeting your Facebook Ads, keep in mind the Lookalike Audience option. It’s a unique option provided by Facebook that identifies and targets users who are similar to your current customers or Facebook fans. Reaching your potential clients has never been this easy. After you’ve produced and distributed your content, it’s time to reap the rewards of your hard work. For example, an incredibly valuable insight would be how each topic or area of interest was perceived by your audience. Were they engaged more by short video tutorials, how-to articles, comprehensive articles, or a expert advice? It’s important to know this because it shows the direction in which your content activities should be targeted in the future. But analysing with a long-term perspective can be difficult. Where do you even start? Somewhere in the galaxy (at Sotrender, to be specific ;)) there is an easy way to segment pieces of content which were published on your Facebook Page and analyse them. What do you do from here? Tag content with appropriate labels and analyse their performance over a relevant period of time. Especially keep an eye on how engagement and reach look in each category. Sometimes one video may perform worse than an infographic, but the overall performance of video tutorials might still be better than infographics. And this is a valuable insight that matters. See how our clients take advantage of our content strategy feature – a unique chart only available with Sotrender! Obvious or not, Facebook and other social media channels can help you create your content and marketing strategy. Both processes – creating a strategy and creating content – are inseparably linked to each other and affect each other. It’s important to constantly analyze, adjust, and improve them to maximize your overall performance and achieve your goals.